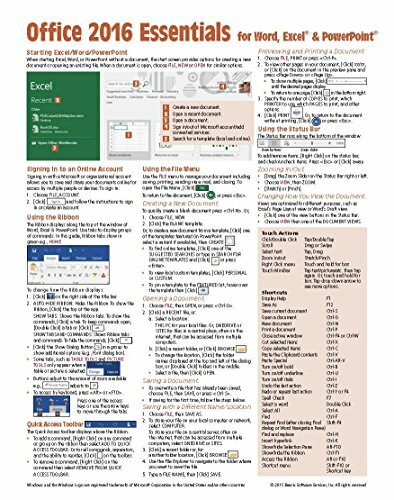 Laminated quick reference card showing step-by-step instructions and shortcuts for how to use features of Microsoft Office 2016 (Windows Version) that are common to Word, Excel & PowerPoint. Written with Beezix’s trademark focus on clarity, accuracy, and the user’s perspective, this guide will be a valuable resource to improve your proficiency in using Microsoft Office 2016. This guide is suitable as a training handout, or simply an easy to use reference guide, for any type of user. Great companion product to Word 2016 (ISBN 978-1939791917); Excel 2016 (ISBN 978-1939791924); PowerPoint 2016 (ISBN 978-1939791931), Introduction Guides. Also includes a list of keyboard shortcuts common to Word, Excel & PowerPoint.